Sonata quasi una fantasia in C-sharp minor, Op. 27 No. 2 "Moonlight"
Grand Sonata in D major, Op. 28 "Pastoral"
Rhythmically astute yet flexible fingerwork, lean yet well-modulated sonority and stylish intelligence. 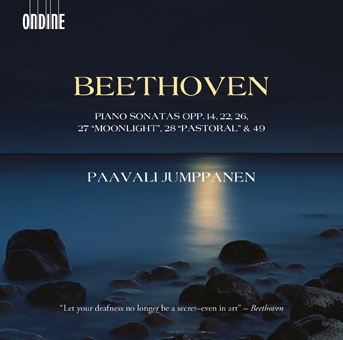 This double-CD release is a third volume in pianist Paavali Jumppanen's ongoing recording cycle of the Beethoven piano sonatas. This release includes Piano Sonatas Nos. 9-15, 19 & 20 - all written between 1798 and 1805, among them perhaps Beethoven's most famous Piano Sonata, the "Moonlight" Sonata.